I take this opportunity to welcome you all to this 2nd Universal Health Coverage Conference and to Nyeri County. I’m indeed delighted to be part of this gathering and to participate in this critical conference. The theme for this year’s conference is Universal Health Coverage for Sustainable Development with a focus on Trans-formative Solutions to Halt and Reverse the Non-Communicable Diseases Epidemic. I am delighted to note that this theme resonates with my government’s top priorities. 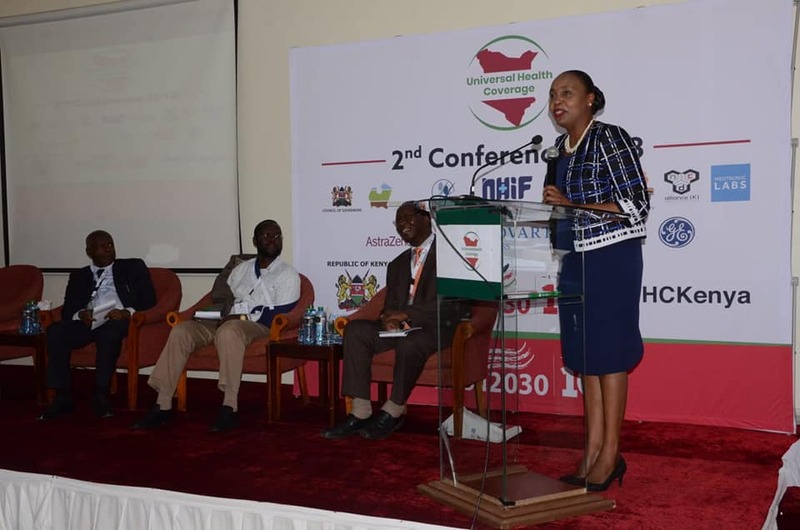 Let us not take it for granted that this 2nd UHC conference is taking place at a time when the World and Nyeri County in particular, is grappling with the rising burden of Non communicable conditions. Further, the conference comes at a time when the President has reiterated his commitment to improving health of Kenyans through prioritizing Universal Health Coverage as one of his Big Four agenda. There cannot be greater political will than this! This conference provides us with an opportunity to reflect on the burden posed by Non Communicable Conditions through sharing experiences and best practices, tracking the progress of implementation of our policies and advocating for multi-sector engagement in this trans-formative journey of halting the epidemic. Despite NCDs accounting for 28% of the disease burden, funding allocated to deal with the problem has not been commensurate due to competing priorities. It is against this background that the country has been scaling up investments across the health pillars as part of health systems strengthening and support required in the fight against NCD. To reverse and even halt the burden of NCDs, there is need for sustained focus and increased investments in particularly in NCDs prevention and treatment. We therefore need greater attention paid to institutionalized screening, health promotion, creation of awareness for lifestyle change and risk factors for NCDs , procurement of essential medical supplies, provision of specialized diagnostic & treatment facilities, enhanced advocacy and strengthening of partnerships. As we are well aware, NCDs are distressing to the family, profoundly affecting both the family’s daily functioning and economic situation due to both the loss of income and the expenses associated with health care costs. The role of Universal health Coverage towards sustainable development is not in doubt. I am glad that Nyeri County has been selected as one of the four pilot counties for Universal Health Coverage (UHC) under the President’s Big Four agenda. My Government believes that UHC will build on our vision of “A Wealthy County, with Happy, Healthy and Secure people”. We are committed to fulfilling the Constitution provisions that guarantees all citizens the right of access to the highest attainable standards of health. Our commitments are reflected in our 5 year County Integrated Development Plan (CIDP) and demonstrated the achievements we have made over the last 12 months. To support the UHC roll-out and implementation, the County Government of Nyeri commits to health systems strengthening in health infrastructure, human resources for health , procurement of medical equipment and supplies as part of strengthening primary health care . My government allocates approximately 40 % of the total county budget to health sector. However, there is inadequate funding for capital projects with 75% of the funds going to cover personal emoluments. Insurance uptake is notably low in the County at 32%, and out of pocket expenditure stands high at 43%. We are desirous of changing this health financing picture. Moving forward, the County Government is focusing on strategies geared towards increasing enrollment into the National Hospital Insurance Fund (NHIF) as well other insurance schemes. This will provide financial protection through reduction of out of pocket payments when accessing care. In this regard, I call upon all Kenyans to register with NHIF and other private and community based health insurances to ensure they are not impoverished by the burden of paying for health care from out of pocket. In this journey, we aspire to progressively shift our main focus from ill-health and hospitals, to communities and empowering families to take charge of their own health. This by extension will play a key role in reversing the trend of non-communicable diseases. In this regard, my government will ride on our very robust community health system that comprises of 251 functional community health Units (CHUs) spread across all sub-locations. In the last one year alone, our 2,510 Community Health Volunteers (CHVs) screened in excess of 20,000 community members for diabetes and hypertension. We believe that our community health program will provide a platform for the successful roll-out and implementation of the Universal Health Coverage Program. The Constitution of Kenya 2010 under schedule IV devolves health function to County Government and clearly defines functions of county governments and national Government. The same constitution recognizes the need for mutuality in cooperation and consultations in delivering services to the people. My county government fully appreciates this expectation and has continuously worked with national government with success. Our collaboration in the Managed Equipment Services Program, renovation and equipping of our cancer unit and the soon to be established specialized eye and dental unit at the Nyeri County Referral Hospital is worth emulating. Allow me to specifically appreciate the National Government for elevating Othaya Hospital to a Level VI hospital specializing in management and treatment of NCDs. This facility will be one of a kind in the Country. Towards ensuring that our decisions are informed by credible data, we are cooperating on the automation front. Our current collaboration with the National Government in automating Nyeri County referral and Mukurweini hospitals is progressing well. This is to be scaled-up to other hospitals and rural health facilities in the next five years as part of a transition to electronic medical records and health automation required for improved data for evidence-based decision making. I urge you to delve deeper into how county governments and the national government can optimize the gains from current and future collaboration between the two levels of Governments on NCDs and NCDs-related activities. Finally, I call upon all stakeholders, across sectors, to join hands in confronting and halting the burden associated with NCDs.